Dimitrios Kambouris/Getty ImagesStephanie McMahon attends the WrestleMania 30 press conference at the Hard Rock Cafe New York on April 1, 2014 in New York City. You couldn’t get a marketer that’s more of an embodiment of the brand they look after than Stephanie McMahon. McMahon is WWE’s chief brand officer, who has worked for the company since she was a teenager, in a variety of roles from selling merchandise to jumping into the ring as a professional wrestler herself. McMahon is also married to one of the franchise’s biggest-ever superstars, Triple H. She is also the daughter of WWE chairman and CEO Vince McMahon and its former CEO, Linda McMahon, who retired to run for US Senate in 2009. The McMahon family first entered the wrestling world back in 1953, with the Capitol Wrestling Corporation, which subsequently became the World Wrestling Federation, and later WWE, which generated $658.8 million in revenue last year. We caught up with McMahon at the Cannes Lions advertising festival last week, discussing a range of topics from her unusual upbringing, to being a woman in business, the qualities she looks for in budding wrestling superstars, and her favourite WWE star of all time. Lara O’Reilly: You had a storied career before you became WWE’s chief brand officer. Tell me about the progression. Stephanie McMahon: Absolutely, so I really first started when I was about eight years old and I was modelling merchandise in our catalogue. But then I basically interned in our company in various different positions, since I was about 15. I worked the switchboard, I interned in human resources, I was responsible for collating, and stapling, and distributing our newsletter — at that time there was no digital — I interned in television production, putting together comp rails and things of that nature. I interned for our live events marketing team and digital media, which at that time was really in its infancy and we had a website that functioned much like the old Coleco “Donkey Kong” game. Ethan Miller/Getty ImagesWorld Wrestling Entertainment Inc. CEO Linda McMahon and her husband, WWE Chairman Vince McMahon, appear in the ring during Vince McMahon’s 64th birthday celebration at the WWE Monday Night Raw show at the Thomas & Mack Center August 24, 2009 in Las Vegas, Nevada. Once I graduated college I did a couple of different sort of unique internship positions, if you will, I spent three months in my mother’s office, who was then the CEO of our company and I really got to just sit in every meeting that she had and I would write down questions on a yellow legal pad. And after the meetings were over I would just pepper her with questions and she would take the time to answer them. And then I spent six months in my father’s office, who is the chairman and head of all the creative — my father is obviously now the chairman and the CEO, my mum resigned to run for US senate — and under my father’s tutelage I had the opportunity to really be exposed to the creative process and how all of that worked. Then I went to our sales office, and I was an account executive and at that time I also started as a character on TV. I think I was about 22. I grew the creative writing team from about three people to about 30 people and developed a bunch of different innovations within that team. Ultimately that led to me taking over our live events, booking, and marketing function, taking over our talent relations and talent development function. Then, ultimately my husband [wrestler Triple H] came in as an executive and took over the talent and the live events piece and I went on to take over digital and, at the time, publishing. Then creative became all encompassing of everything, which made a lot of sense. What we really wanted to do was combine all the efforts, because our creative was siloed and everybody wasn’t communicating and it wasn’t an efficient process. So we brought all the creative teams together, we put them on one floor, tore down the walls, opened up the whole floor so that everybody could have this free-form way of working. Actually it was such a great model and it was also pretty cost-effective so we wound up doing that throughout our office buildings. Then I transitioned from that role into my role now as chief brand officer. It’s important to note, although I’ve never even thought about it until someone pointed it out the other day, that I was the first woman ever in charge of all of those departments. And I’m the first chief brand officer for our company. O’Reilly: How has that been? When you imagine WWE you imagine lots of big, beefy, testosterone-filled males, lots of masculinity … how does that work and and how do you assert yourself? Dimitrios Kambouris/Getty ImagesHulk Hogan, Randy Orton, Stephanie McMahon, Triple H, John Cena and Daniel Bryan attend the WrestleMania 30 press conference at the Hard Rock Cafe New York on April 1, 2014 in New York City. McMahon: I think anybody has, regardless of your gender, we all have equal value if you have value to bring and value to provide, you just have to be willing to use your voice. I’ve never felt my gender was an obstacle. There have of course been moments in my career when it has slapped me in the face but the reason I felt it slapped me in the face was because it wasn’t something that I had contemplated before. When you consider that my mother was the CEO of our company, helped my father grow our business from a north-east regional wrestling promotion into a global brand. And now my mum designs to resign so she runs for US senate, and now at 67 my mum just launched a new company called Women’s Leadership Live, she is the cofounder and CEO, and it’s all about empowering women to be successful in business however they define success. When you have a role model like that you really don’t ever look at gender as an issue and it’s about owning your place and taking charge of your role, regardless of what you look like. O’Reilly: How much do you listen to what fans say on social media and how much does that influence what you do as a company, but also storylines? JP Yim/Getty ImagesSeth Rollins and John Cena battle it out at the WWE SummerSlam 2015 at Barclays Center of Brooklyn on August 23, 2015 in New York City. McMahon: I think it’s one of the secret sauces to our success if you will is that our fans are a part of our show. They engage, they chant, they cheer, they boo. There’s a problem when they don’t react. So, in essence, every live event is like a focus group. So we are getting that real-time feedback from them, in the arena. Another reason why I think social media was so successful for WWE is because of that fan engagement, because they are a part of what we do, therefore, even when they are not live in the arena, they have influence through social media. I think that it’s so important. A lot of brands just push messages out on social media, but that’s not what social is about. Social is about engaging, it’s about a conversation, it’s about listening and then responding, it’s an ongoing conversation with our fan base. So when you consider the fact that our fans influence what happens in a match — a lot of it is improv, so they can dictate the flow if something’s not working, you can make an adjustment on the fly. They dictate what’s being said. They can often chant or you can get a feeling they are not engaged with the content, so you have to find a way to transition around that. McMahon: Absolutely, so live, real-time is social but if you don’t have a device in your hand and you’re in the ring, then you’re interacting with the audience. The live audience is digital and social, but even sales. All of that data and information creates more feedback that you can take in and apply. You notice themes throughout. 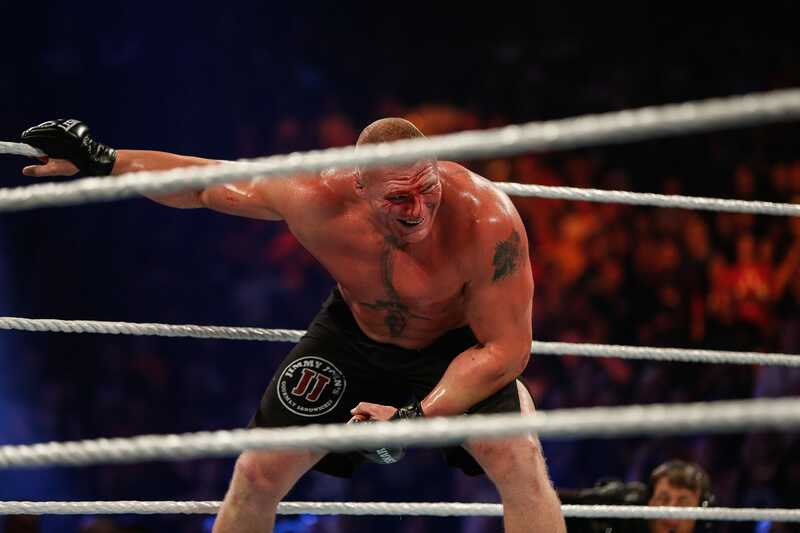 JP Yim/Getty ImagesBrock Lesnar in action during his fight against The Undertaker at the WWE SummerSlam 2015 at Barclays Center of Brooklyn on August 23, 2015 in New York City. 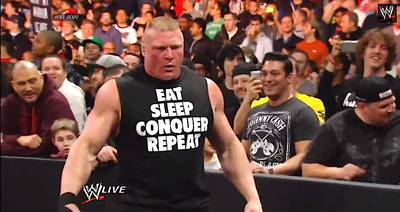 O’Reilly: Brock Lesnar [an NCAA wrestler, turned-WWE star, who is now rising to UFC fame] is a really interesting story right now. You’ve not necessarily ever done cross-brand promotions with the UFC before. Are you realising there is a place for both UFC and WWE? Do they compete in any way? And also the fact that he’s flipped from one to the other and then back again. McMahon: Brock is a unique proposition, but just to get to the broader question: UFC is not a competitor to the WWE because we are entertainment and UFC is competitive sport. It’s very different. WWE is all about protagonists and antagonists where ultimately our conflicts are settled in the ring with action that is akin to Hollywood. It’s incredible stunt-like action and the match itself tells a story, but our audience is engaged in the characters and their storyline. It has to be relatable to them so that they care to see the tragedy or triumph and we’re at an advantage because we can script it. UFC, they can make a big star but the second that person loses, they lose credibility, and how do you continue to make that star rise? So I think we have the best of both worlds and the opportunity to tell the stories in the way we want to tell them. In Brock Lesnar’s case it was really a special case that we are allowing him to do this fight [against Mark Hunt on July 9]. But like you said it’s not really a cross-promotional opportunity, but we are allowing him to participate in that fight. We are not supporting the fight necessarily but, again, it’s not a competitor to us and the more that our superstars, that’s how we refer to our talent, the more they do outside of WWE, the more awareness it generates and the broader the audience can be that is then brought back into our properties. So we recognise the value of that. O’Reilly: I wanted to ask about WWE Network and how it’s performing. What expectations did you set at the start and now where are you at? McMahon: It is now our fastest-growing and second most-profitable business, behind television rights and licensing. For WrestleMania, we announced 1.8 million subscribers and in just two years that’s not too shabby. Our whole content proposition, it’s like it functions almost exactly like Netflix, except you get a little bit more bang for your buck. So we like to say it’s like Netflix only better, if you’re a WWE fan, because not only do we offer the VOD content, which we currently have over 5,000, which we continue to add our library to. We create original programming. We also offer our live, monthly specials, our pay-per-view specials, for incredible value of $9.99 a month, versus $59 and up in the US. Also, we have a linear channel, so you can turn on and watch it just like a regular, pre-programmed channel, or you can have the customised experience. It really is very unique that way and it was one of the first to market prior to HBO and a couple of the other big launches. O’Reilly: How do you treat rights licensing when it comes to things like Twitter, Facebook, Snapchat — these are huge distribution channels that media companies are learning how to use and monetise. For example, certain sports companies like the NFL have cut deals with Twitter, are you trying to do that kind of thing as well — selling on rights as opposed to just putting your content out there for free? How do you divide it up? Then of course our television rights distribution, internationally, because we are in 180 countries and 25 languages. Then the WWE network, which is our biggest focus as a company right now. O’Reilly: So when you look at those social channels, it’s about them being advertising-funded? McMahon: We also recognise the value of the share of voice, so we utilise a content ecosystem and it doesn’t matter to us where our fans enter in that ecosystem. We are platform agnostic: we want to be everywhere so our fans can consume our content any time any place anywhere and on any device. So whether it is TV or our live events, which is also an experiential opportunity, which is more and more what the millennial audience want, but also for families because families can go and it’s affordable. It’s not so ridiculously overpriced that you can’t take your family and enjoy it. And we come to you. We have over 400 live events every year, so we are bringing our product to you. Then we have digital and social, I mentioned YouTube, but also Facebook is a huge partner for us. So is Twitter, Instagram, Snapchat is absolutely a key focus for us as well. It’s really important to utilise all of those different channels again to drive awareness and interest in your brand and engagement. And ultimately driving them back to the core product. And because we are a storyline-driven business and we are 52 weeks a year, with no off-season or re-runs, we keep the storylines going. Then we have over 200 different talent IP, over 200 superstars who are in and of themselves their own brands, who are also on these social channels keeping you engaged. We have over 650 million social media followers right now and that number grows every single day. O’Reilly: Are there any particular geographical areas you are focusing on expanding into? McMahon: Yes, in China for example, we just had a big press conference where we announced a new media partnership with PPTV. We announced a live event coming to Shanghai in September, and also we signed our first ever Chinese superstar, whose name is Bin Wang. And we also conducted a whole talent recruitment and try-out for four days in Shanghai at the Mercedes Benz arena. Out of that I believe we had seven recruits who we are vetting to potentially bring back, so it’s really exciting. China is a focus for us, India is a clear focus for us, as well as South America. O’Reilly: You were talking about your mother earlier and the inspiration you have taken from her. She left to run for US senate. What are your thoughts on the current presidential campaign right now? Michael Loccisano/Getty ImagesEVP and COO, U.S. Products, NYSE Group, Lawrence Leibowitz, WWE Marketing EVP Michelle Wilson, WWE CEO Linda McMahon, WWE EVP of Creative Development and Operations, Stephanie McMahon Levesque and WWE COO Donna Goldsmith ring the opening bell at the New York Stock Exchange on March 27, 2009 in New York City. McMahon: I think it’s interesting, I was at a breakfast earlier today, where it was mentioned not necessarily the importance of the candidates but what’s happening in the culture in America right now and really in other countries as well, which is the voice of the people. The need for authenticity and the need for a real connection point. Trump was brought up as an example only because he hasn’t done the traditional marketing and advertising spend, so he is presenting himself as more of a voice of the people, leveraging and utilising social media in a very clever and smart way, regardless of what your affiliation is, it’s an interesting time in the world right now and something we should all be paying attention to. O’Reilly: How about your own advertising spend? How much is geared towards digital now versus the traditional channels? McMahon: I wouldn’t say we are traditional in any way, but again we are really platform agnostic. What we do is we utilise and leverage a lot of our own properties to really reach our consumers more directly and it’s a healthy mix of TV, digital, social, etc. There are three key pieces to keeping audiences engaged, and the evolution of that. One is a content-first strategy because you need to provide the best possible product, no matter what your brand is, it’s got to be a great, incredible product first. The second piece is a content ecosystem, which is what we were talking about before, leveraging and utilising as many different platforms as you possibly can to continue to drive the conversation so people have the opportunity to enter your brand from different ways. Third, mostly importantly really, is to have a brand that has purpose and value. Our company’s mission is to put smiles on people’s faces the world over. Whether that’s through our entertainment programming or if that’s by giving back to the community. O’Reilly: What do you mean by “giving back to the community”? McMahon: For example, we have four key pillars of our community relations opportunities. They are: diversity and inclusion, education, hope, and military. 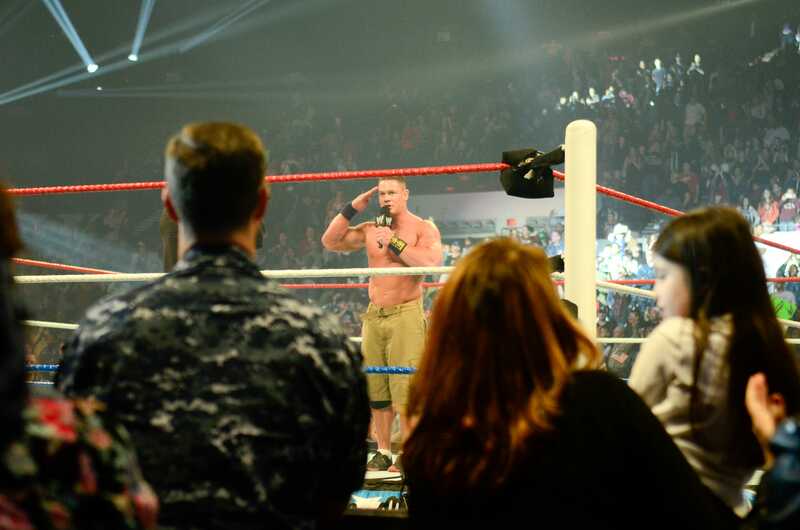 Kris Connor/Getty Images for WWEWWE Superstar John Cena performs during the 10th anniversary of WWE Tribute to the Troops at Norfolk Scope Arena on December 9, 2012 in Norfolk, Virginia. For example, we visit US bases all over the world. We go to visit our troops to say thank you for their service. We’ll visit hospitals. We put on a show every single year called Tribute to the Troops, which is a show that is just for our servicemen and women and their families. It’s a whole big pop culture extravaganza. We also provide free tickets to military personnel with a military ID to our live events. For diversity and inclusion, we have partnerships with Special Olympics, we also have an anti-bullying program called Be A Star, and “star” stands for “show tolerance and respect” and I’ve had the opportunity to participate in a lot of these. That’s an opportunity to give back to the local community. We never want to be carpet-baggers, we never just want to come in and take your money, we want to give back. So we will speak at schools with our literacy campaign. We’re here to give you the tools you need to stand up and end bullying in your community. Rob Kim/Getty ImagesWE Chief Brand Officer Stephanie McMahon attends the Make-A-Wish celebration event for John Cena’s 500th Wish Granting Milestone at Dave & Buster’s Time Square on August 21, 2015 in New York City. In the hope bucket, we’ve had a partnership with Make A Wish Foundation, which is similar to Starlight Foundation and others, granting wishes to terminally ill children. We’ve had that partnership for over 30 years and it is one of the most rewarding things we can do. John Cena has granted more wishes than any other celebrity, athlete, entertainer, singer/songwriter, etc. We also have Connor’s Cure which is a fund that my husband and I founded in honour of an 8-year-old fan named Connor Michalek who lost his life to pediatric cancer. Cancer awareness has become a huge focus for WWE and now, we were originally founded with Children’s Hospital Pittsburgh Foundation, where Connor was treated and now we are amplifying that partnership with V Foundation. We are growing that opportunity, which is something that is obviously really near and dear to my heart, very personal, as is all of it, but Connor was special. Then in terms of education, really literacy is our key pillar and we do a WrestleMania reading challenge every year. It’s a digital proposition: you have the opportunity to interact and read with your favourite superstars and I can’t tell you how many mums have come up to me and said: “Gosh my child hates to read but suddenly now I find them reading and engaged because their hero is reading with them online.” I’ve even had mums say that their kids have learning difficulties like dyslexia and challenges reading and how the program is really helping inspire their kids. That’s the most important part of what we do. I think it’s a responsibility for any brand, any media company especially that has such a wide reach, such a broad scale and reach across so many different platforms, it’s not only a privilege to give back in those ways, but I think it’s a responsibility as well. Use your powers for good, to use an old superhero analogy. O’Reilly: If I, overnight, wanted to change my career and quit this journalism lark and become a WWE wrestler, what would I need to do? Mike Coppola/Getty ImagesWE Chief Brand Officer Stephanie McMahon (L) and husband/WWE Wrestler Triple H attend the ‘Scooby Doo! WrestleMania Mystery’ New York Premiere at Tribeca Cinemas on March 22, 2014 in New York City. He really has created an elite team of trainers, there is a medical staff there, we have a partnership with Joe DeFranco for his strength and conditioning program, so we have certified trainers under that program. We are also training commentators, we are training editors, we have a whole digital crew there as well as a television production crew, so it really is the epicentre of learning all of these different facets. We then also have a partnership with Full Sail University, which is a for-profit university in Orlando, to shoot a show for our network called NXT, which started off as our developmental property and has now become a global brand in and of itself, utilising only social media to promote its live event tours that sell out. O’Reilly: What are the best qualities of your superstars? What are the qualities you look out for in these tryouts? McMahon: The number one quality is charisma. You have to be able to connect with the audience. That is that magic “it” factor that designates a star from someone who is just never going to be a star. You can’t teach charisma. You can draw it out of people if it’s there and they haven’t quite figured out how to utilise it yet, but it’s just one of those things, that’s why they call it the “X factor”. O’Reilly: Beyond charisma, you need to be seriously athletic. McMahon: You have to be very healthy. It’s not that you have to have a particular body type but you need to be healthy because you have to be able to sustain the lifestyle. When you consider that we are live for 52 weeks a year, there is no off-season so you need to be in the best shape you possibly can physically and mentally in order to maintain that schedule, as well as the physicality and the athleticism in the ring. You have to be an athlete and you have to be able to speak well — a lot of what we do is conveying character. While they are not necessarily actors, per se, you are playing a role and you do need to get the audience to invest in you, to want to relate in you, to care to see if you win or lose. That’s the magic model, if you don’t care about the match, you’re not invested in it, why would you watch? You need to care about these performers to want to see them win or lose. So you have to be articulate. O’Reilly: Over the years, your husband aside, perhaps, who has been your favourite superstar? McMahon: My favourite superstar of all time is my friend Andre the Giant. I grew up with Andre, he was always my friend and I think he taught me a long time ago, regardless of how people judge you for what you look like, you need to be true to yourself. My father has this expression that you have to be able to look yourself in the eyes in the mirror, you know, and know that you’re a good person. If that’s true and you feel good about yourself then that’s all that matters no matter what other people’s perceptions are.